A new Aldi Grocery Store is currently under construction near Cherrydale Point on Pleasantburg Drive. The popular german grocer has a reputation for saving customers money by keeping the stores lightly staffed, and charging for bags, and requiring customers to return their own carts by a nifty system where you insert a quarter into your cart to unlock it, and it’s returned to you when you return the cart to the front of the store. They’ve also just announced they accept contactless payments (Apple Pay, Android Pay and Samsung Pay) in all of their stores. They also have a reputation for paying their employees significantly highers than the minimum wage, which is unusual amongst American supermarkets. Aldi does things a bit differently than other grocery stores, but it’s not necessarily all cheap and bad. You can save a decent amount of money by buying some of your more common commodity-type items and ingredients there, and making a quick run by your normal grocery store for specialty items that they don’t carry. They even have an $8 bottle of wine named one of the best in the world. 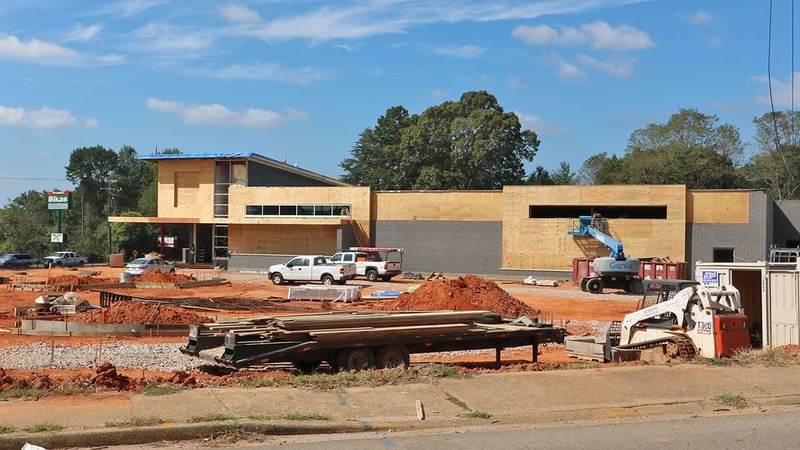 There are currently 3 other Aldi grocery stores in greenville – one on Woodruff road, one on Chalmers Road near 85 and Mauldin Road, and one on White Horse Road in City View. There are also locations in Taylors and Greer along Wade Hampton Boulevards.